The best way to create a basketball dynasty. While not as action packed as NBA 2K14, NBA General Manager 2014 does a serviceable job recreating the experience of one of the sport's most important duties. It may be a bit overwhelming for some, so here are suggestions that will help you win a championship. 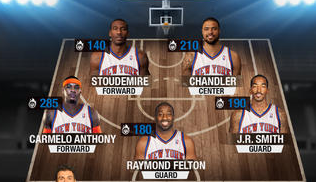 How do I create the player line-up for NBA General Manager 2014? Building a player line-up is easy. Simply go under the Team tab at the bottom of the page and select Line-up. You'll see the starting five, with additional players at the bottom. You can mix and match however you choose, but make sure you have a couple of guards and forwards, as well as an all-around center. You can also hit the "Best 5-Man Unit" tab at the top to go with the best overall team, in case you don't feel like experimenting. How can I add free agents to my team in NBA General Manager 2014? There are plenty of free agents to choose from. Head to the Home tab and select "Free Agents." You'll see all the ones available in the Forward, Guard and Center categories. See which one's right for you and place your bids. There will be times when others compete for stars, like the Clippers' Chris Paul, which makes acquiring them a bit tougher. Keep at it, and eventually you'll land new players. What if players perform badly in NBA General Manager 2014? Keeping your players healthy is of the utmost importance - otherwise, that's how slumps get started. Make sure you visit the Training option located under the Team tab. Here, you can select players showing fatigue and make them rest. You can pay coins to speed up the process, or wait about an hour for them to improve. It's best to wait until they're back at full strength. How do you play games in NBA General Manager 2014? Go to the Home tab and select Play Match. Your five starting teammates, backed by the 6th man, will be the ones taking part in the action. Games simulate over a matter of seconds, so don't worry about having to sit through slow periods. You can also skip to the end if you prefer, just to see if you won or lost. This is the best way to tell if a player's under-performing and needs to be replaced, or if you need to condition someone on your squad. There is one small catch, though. With each game you play, you take off approximately 15 energy points from a meter that appears on the top of the page. Once that runs out, you'll need to wait an hour or so until it refills a bit before playing again - or you can use your in-game coins or money to speed up the process. Pace out your games as often as you can. Usually, your assistant will provide side duties to earn extra money, such as signing new fans and specific challenges. Does NBA General Manager 2014 provide social interaction? While you won't find direct chat or the sort of social features in the NBA Courtside app, you will find fellow players with higher levels that you can challenge. In addition, you can swap friend codes with other players, turning them into fans. The more fans you have, the better your ranking gets, and the quicker you level up - which opens up more options and better experience. Do I need to use real money in NBA General Manager 2014? There are two currency types in the game - cash and coins. You'll use both when it comes to acquiring free trades, and on occasion, power-ups to bring your team and charge meter back to full strength. If you're going after a particular superstar, you may not have enough cash. The game provides an option to add to your bankroll with $4,000,000 or 40 coins for $.99 in real money - which isn't bad. If you prefer more, the offerings go as high as $99.99 (for $405,000,000).